Fallen Kingdom is the first sequel to the hugely successful soft reboot of the Jurassic Park film franchise in Jurassic World in 2015 which was helmed by Colin Trevorrow who also wrote the plot for Fallen Kingdom but handed over the directing reins to talented Spanish director J.A. Bayona whose previous works included A Monster Calls (2016) and The Impossible (2012). The two main leads from the first film – Chris Pratt and Bryce Dallas Howard – return to the front the sequel and there is just enough plot to allow them to return to a film which is also knowing enough to address plot threads from the first film in a humorous way. Humour is definitely Chris Pratt’s strength and he plays the roguish and charismatic male lead role very well – his portrayal of Peter Quill in Guardians of the Galaxy is most certainly a template that modern action blockbusters can follow. Co-star Howard also inhabits her role well although as a summer blockbuster every part is two dimensional to a point, with one or two pronounced traits to help identify each character if they are lucky, although the chemistry between the two main stars remains good. 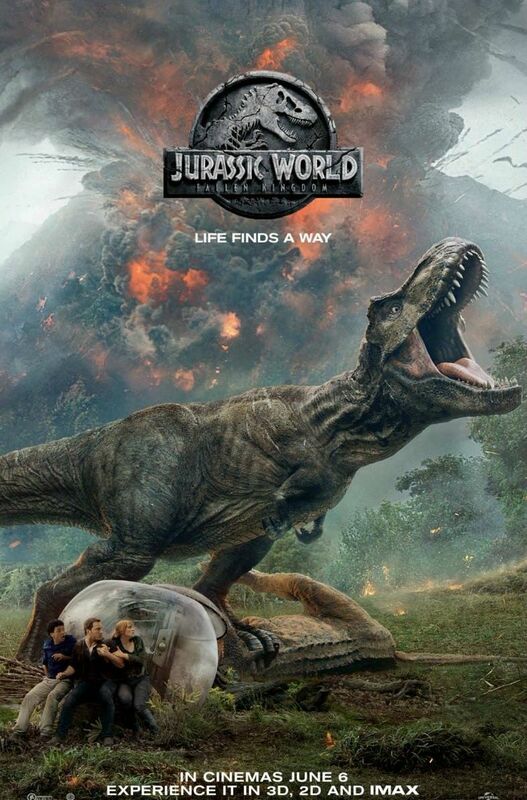 Back to the plot, though, and we see our main leads compelled to return to the scene of the action from the first film – Jurassic World – motivated by wanting to rescue some of the dinosaurs from Isla Nublar from imminent death due to a big volcanic eruption on the island. The story then follows a typical Jurassic World structure, with action set pieces and corporate greed, but throwing in an interesting plot point about genetic engineering. Of course, after the set-up it all goes south and the action gets cranked up as expected. There’s even some hints of a less intense (12A version) Aliens (1986) in this film as Bayona’s stylish direction literally paints his vision of Jurassic World with light and darkness while Jeff Goldblum is back, if only briefly, to make a speech while looks tacked on and there is the briefest of post credits stings if you’re interested enough to hand around till the end of the credits. The ending becomes fairly obvious with the inevitable introduction of raised stakes and an interesting plot revelation that is barely addressed at the climax and although clever direction squeezes a little bit of tension into proceedings there’s very little to surprise except for the growing realisation that the series may have gone down a certain plot path for the forthcoming third film in the expected trilogy for which Trevorrow will be back in the director’s chair. Summary: FALLEN KINGDOM is a fantasy adventure sequel in which the remaining dinosaurs at the former Jurassic World resort are threatened by an erupting volcano. This entry was posted in Shooting The Breeze and tagged Bryce Dallas Howard, Chris Pratt, film review, Jurassic World: Fallen Kingdom. Bookmark the permalink.